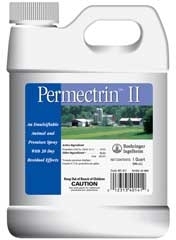 Permectrin II contains a new and unique insecticide compound called permethrin. Since its introduction, permethrin has emerged as more effective and longer lasting than any there known knockdown sprays. 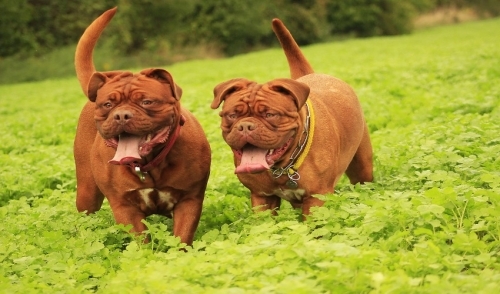 Can be used on beef and dairy cattle, horses, swine, sheep and poultry and around premises for control against a wide variety of flies, lice, ticks, mites, fleas, mosquitoes and other farm insects. Sprayer settings can be varied according to concentration of spray mix desired (1-100 sprayer setting is popular). Mix in clean water to make desired dilution. Timing and frequency of application should be based upon insect populations reaching nuisance levels. Cleared for direct animal use. May also be used with backrubbers. Ready to use dust insecticide. 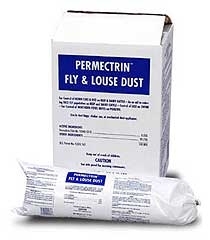 For control of horn flies and lice on beef and dairy cattle. As an aid in reducing the face fly population on beef and dairy cattle. For control of northern fowl mites on poultry. For control of lice on swine. Country Vet CV-80 Farm & Home for Insect Control 25 oz. Contains 0.50% Pyrethrins and 4.0% PBO, but also includes a higher quality carrier that lasts longer in the air, in order to kill flying insects more effectively. Larger 25oz size. Kills and repels mosquitoes, flies, moths, fleas, lice and other flying insects. The best performing, highest quality Farm & Dairy Spray. For use in beef cattle operations, dairies, kennels, animal quarters, milk rooms, poultry operations andmany other areas. 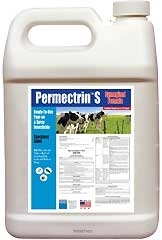 A ready to use 1% permectrin insecticide specially enhanced to better kill lice, horn flies on beef cattle, lactating and non-lactating dairy cattle and sheep.Permectrin S is a synergized version of popular Permectrin. For control of horn flies and lice on beef and dairy cattle. Used as an aid in reducing face fly population on beef and dairy cattle, control of lice on swine, control of northern fowl mites on poultry. Use in dust bags, shaker can, or mechanical dust applicator.